Though St. Louis is often mentioned as Head East's hometown, the original members grew up in south central Illinois. Originally known as the TimeAtions, the band adopted the name Head East at the suggestion of Baxter Forrest Twilight, who was a technician / stage-hand for the band. August 6, 1969 is recognized as the date the band officially became Head East and they played their first gig in Carbondale, Illinois about 100 miles southeast of St. Louis. The band, originally comprised of brothers Roger and Larry Boyd, Steve Huston, John Schlitt, and Dan Piper, would see many members come and go over the next four years. Lead singer John Schlitt and drummer Steve Huston soon left the band to concentrate on their studies and several members performed in their place until John and Steve returned as full time members in 1973. Interim vocalists and drummers included Annie Williams, Joel Motel, Betsy Kreuger, Dale Innes, and Jean Mullen on vocals, and Tony Juodis, Dan Odum, and Bill Keister on drums. The line-up that would take them through their first six albums began to take shape in Champaign/Urbana, Illinois in 1973 where Roger Boyd and John Schlitt had been students at the University of Illinois (Steve Huston had attended Eastern Illinois University in Charleston, Illinois less than an hour south of Champaign/Urbana). Guitarist Dan Piper had left in 1972, and after both Greg Williams and Brad Flota did short stints on guitar, the band held auditions for a new guitarist. Mike Somerville was selected over numerous others who auditioned to be the new Head East lead guitarist. Shortly thereafter, Roger Boyd who had left a few months earlier, rejoined the band replacing Dickie Harney who had filled in on keyboards. By the summer of 1974 Dan Birney had replaced Larry Boyd on bass guitar, joining Roger Boyd, Steve Huston, John Schlitt, and Mike Somerville as members of Head East. Birney had previously played in a band with Mike Somerville's brother Scott. They entered Golden Voice studios in Pekin, Illinois that summer and recorded the tracks to their first album, Flat As A Pancake, which they released on their own label, Pyramid Records. A&M Records soon took note of the bands popularity, and the airplay and record sales of the Pyramid release and signed Head East to the A&M label. Flat As A Pancake was re-released on A&M in 1975 and was certified Gold (representing 500,000 in record sales) in 1978. Single releases of Never Been Any Reason and Love Me Tonight both charted on Billboard's Hot 100 singles chart. Never Been Any Reason has since become a staple of classic rock radio and is one of the most frequently played classic rock anthems in many parts of the country. In 1976, Head East released Get Yourself Up, followed by Getting' Lucky in 1977, the self-titled Head East in 1978, and Head East Live! and A Different Kind of Crazy in 1979. During this time the band was a huge concert draw, regularly playing to large crowds at major venues as the headlining act. But this popularity did not show on the charts, with Since You Been Gone from the self-titled Head East album being the only single during this time frame to crack Billboard's Hot 100. On 20 April, 1980, the line-up of Roger Boyd, Dan Birney, Steve Huston, John Schlitt, and Mike Somerville played their last concert at Kearney State University in Kearney, Nebraska. The band had ceased to be a cohesive unit and the decision to discontinue playing together had actually been made prior to the completion of the tour that ended in Kearney. John Schlitt left the band due to substance abuse problems and attempted to front his own band Johnny for several months, but soon dropped out of the music business. John overcame his problems with drugs and alcohol and in 1985 embarked on a career in contemporary christian music as lead singer of the band Petra. Dan Birney and Mike Somerville also left, choosing not to continue on with Head East. Mike would return to Head East in 1994 after participating in numerous other musical projects including the Somerville-Scorfina Band in the early 80's with former Pavlov's Dog guitarist Stephen Scorfina. Dan Birney worked in radio in Washington state and Iowa before relocating to Arizona in the mid-80's where he worked in Real Estate and operated a pool cleaning service prior to his passing in August of 2003. Remaining original members Roger Boyd and Steve Huston quickly enlisted Mark Boatman (bass), Tony Gross (guitar), and former member Dan Odum (vocals), and recorded the U.S. 1 album, which was released later that same year. This would be the last studio album that Head East would record on A&M Records. After the release of U.S. 1, A&M dropped Head East along with other album oriented rock (AOR) bands in order to put more emphasis on promoting New Wave and Punk bands popular at the time. Head East released Onward And Upward in 1982 on Allegiance Records. Robbie Robinson joined the band on bass for this release, having replaced Mark Boatman. Neither U.S. 1 or Onward And Upward achieved substantial chart success, and the band would once again experience a change in personnel. Over the next few years, Tony Gross, Steve Huston, Dan Odum, and Robbie Robinson would all depart and several new members would join the ranks of Head East. Ricky Lynn Gregg, Brian Kelly, Joel Parks, J. Jaye Steele, and Matt Stewart (formerly of Starcastle) all joined Head East during this timeframe but would leave the band before the release of the next album. Kurt Hansen and Donnie Dobbins would join during this same period and Tony Gross would return in 1987 after a three years absence. Choice Of Weapons, released in 1988 on Dark Heart Records, was Head East's last studio album. This album took a departure from the traditional Head East sound and featured a more modern synthesized sound reminiscent of other popular groups of the late 80's. The band line-up at this time included Roger Boyd, Tony Gross, Kurt Hansen, and Donnie Dobbins. Several other musicians are credited on this release, including former members Dan Birney, Ricky Lynn Gregg, Brian Kelly, and Joel Parks. During the next 3 to 4 years, the Head East line-up continued to evolve into the early 90's. Donnie Dobbins and Tony Gross left the band and remaining members Roger Boyd and Kurt Hansen recruited several new members including Vance Best, Steve Riker, Randy Rickman (formerly of Exile), and Jim Murphy. 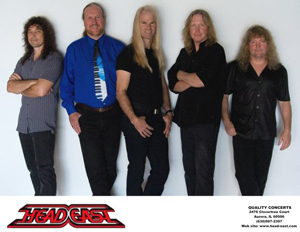 From about 1992 to 1994, at a time when classic rock was beginning to regain popularity, Head East began assembling a group of musicians who would not only remain together for several years, but would return to the classic Head East sound. Rich Creadore joined taking over duties on bass and Dan Kelly replaced Riker on drums. Though Kelly left for a short while during which Mike Mesey played drums, Kelly again returned as did guitarist Mike Somerville. Kurt Hansen left in 1995 and was replaced by lead vocalist Tom Bryant. The lineup of Roger Boyd, Tom Bryant, Rich Creadore, Dan Kelly, and Mike Somerville would remain intact from 1995 to 2000 when Kelly left to work for the band Sister Hazel, and was replaced by former Head East drummer Mike Mesey. In the fall of 2001, vocalist and guitarist Richie Callison joined the band replacing Tom Bryant on lead vocals and eventually assumed sole lead guitar responsibilities upon the departure of Mike Somerville. The lineup of Boyd, Callison, Creadore, and Mesey would stay intact for a few years before founding member Roger Boyd assembled a new band. Head East is currently a 5-piece band consisting of Roger Boyd (keyboards & vocals), Greg Manahan (bass, lead guitar & vocals), Glen Bridger (lead guitar & vocals), Eddy Jones (drums & vocals), and Darrin Walker (lead vocals & bass). The band's superb musicianship and versatility along with their strong vocal abilities, resulted in the reinstatement of some classic Head East songs to the set list along with some new covers of classic rock favorites, making for an exciting new live show. Head East has been regaining it's popularity over the last several years, no doubt due to the resurgence of classic rock music and Head East's presence on the internet. This rise in popularity has resulted in the issuance of three CD's, Concert Classics Vol. 7 on Renaissance Records in 1999, Live On Stage on Universal/A&M in 2000, and 20th Century Masters - The Best of Head East - The Millennium Collection which was released by Universal/A&M on 25 September, 2001. A fourth release tentatively titled Flying By Night (import re-issue of Concert Classics Vol VII under a new name) was pulled from production by NMC Music of London England prior to any copies being issued. Head East has brought more than three decades of rock to their fans, a tradition that is destined to continue for many years. Roger Boyd, leader and keyboardist of Head East, has stated that Head East will continue to rock as long as he can lift his synthesizer over his head and play. And he looks forward to bringing Head East music to the fans for many years to come. Check out Head East music and tour schedule at http://www.head-east.com.